Gilliam: The face of a man who has it all under control. 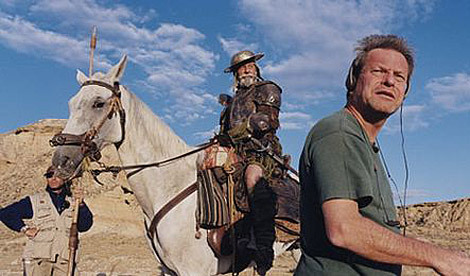 Lost in La Mancha – There is bad luck, there is Murphy’s Law, then there is Terry Gilliam on a shoot. Ironically, by not making the actual movie, Terry Gilliam may have nailed the essence of Don Quixote. It was almost like the filmmakers were making a fake documentary about the making of a movie about Don Quixote, a man that was a dreamer, chasing and trying to conquer the impossible, and by not being able to actually make the movie, the documentary was actually capturing the story more honestly than any narrative film could have. I was getting very meta about this movie. I had layers about how each thing that happened was in a way just being exploited to feed the true movie (Lost in La Mancha) and the fake movie (The Man Who Killed Don Quixote) was merely a vessel for this. I was thinking how brilliant it would be if the documentary were truly the scripted story. Oh, doesn’t Terry Gilliam wish that were true. Unfortunately for him, this all actually happened. A rain storm to end all rain storms, Jean Rochefort really had a prostate problem, insurance for the movies is a bad as it is for the rest of us, etc. etc.. Terry Gilliam is cursed. Some of the bad luck he brings on himself, some of it is out of his hands. Either way though I will watch any movie he does or does not make. Even a failed Gilliam movie sure is fun. 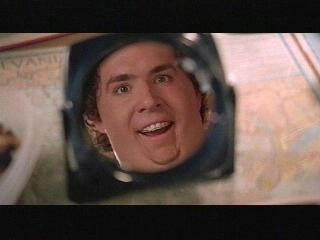 Ryan Reynolds portrayal of fat people more damaging than trans-fats. Just Friends – I know what you are thinking: Brandin, what the carrot cake are you doing watching that? I have no good answer for you. Amy Smart? Maybe? I got nothing. Am I proud that I watched it? No … yes … both, kind of. As a film lover and a human being, I am a little embarrassed. BUT it is a testament to my ability to watch any movie. I am kind of a modern day hero actually, but instead of being able to leap over tall building in a single bound, I can sit through a movie that won Best Hissy Fit at the Teen Choice Awards. Just Friends is a stirring tale of Ryan Reynolds in a fat suit wants girl, girl just wants to be friends, Ryan Reynolds takes off fat suit and still can’t get girl … or can he? (Spoiler: he can.) As with most movies though, it had a few moments. (Ryan interpreting the character as “fat” to mean that the character must also be fairly dumb, was not a big highlight.) Most of the comedy stemmed from scenes involving Anna Faris being Anna Faris. Would I recommend the movie just for her? No. Would I say sit through it if it is on TV? Not the whole thing. Maybe, if it is on TV, stay watching it until a commercial break, then go find a mirror, look into it and spend the next 10 minutes doing some serious soul searching. Crazy Heart – Vatche wrote up a nice review on this movie that you can read on LR, so I will be brief. I had heard great things about Jeff Bridges and I was not disappointed. It was a little like The Wrestler, and like The Wrestler, it was driven by a performance. Mr. Bridges delivered big time, the story just had to simply be there for him to navigate through. I do not hold cliches against a film as long as something else is given to me. I need great direction, or an innovative way to tell an old story, an in depth character study, great performances. With regards to this last point the entire cast (most notably Jeff Bridges, but not limited to) definitely came with their A game. I would definitely recommend seeing this movie. The story is a little predictable (not all points, but at times), but you will forgive this film for that.